The principle facilitates in determining the position and identity of the matching of cards in two decks, which have been randomized by the cutting of each deck. The principle works in conjunction with a memorized stack. A presentation is given where you don't have to commit a stack to memory. Two decks are on the table. After two spectators have each cut one of the decks to their heart's content, the magician is able, without handling the cards, to tell whether there will be a matching of cards (ie: 2♥/2♥)) at a certain position in the decks or not - and if there is a match of cards how many matches there will be and moreover at which position(s) in the decks the matching occurs. On top of all, if there is a match, he is able to tell which specific cards will match. The principle was discovered as a use for the memorized deck. Upon discovery it was however realised that there could be an accommodation for non-memdeck workers. Due to the structure of a unique presentation and a slight, easy to do, technical modification it is possible for non-memdeck workers to present the above effect. So at last there is a memdeck effect for non-memdeck workers. Yes, you read it correctly. You're not hallucinating and this is not a brainfart of a deranged mind. The presentation that makes this oxymoron possible is included and what's more, this presentation turns the performance into a very funny event. Done with two decks the principle works stack independent. With one deck it is limited to a rosary stack. In that case the deck is split into two halves and instead of exact matches the performer is able to tell at which position there is a matching of mates (ie: A♠/A♣) in the separate halves. With a rosary stack there will always be two pairs of matching cards, which together will be a four-of-kind. The effect can be framed as a demonstration of a prodigious memory or extraordinary mental agility. A two-deck memory routine with four phases is included that works with any stack. A five-phase memory routine is possible with one deck but it is stack dependent. Both routines show a succession of effects with increasing impact. Another application of the principle is a number prediction. With a bonus effect called "The really smart phone" the performer shows that his phone has a successful card-finder app. 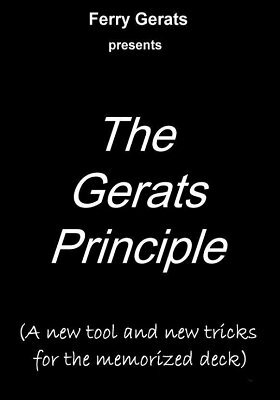 Because of the method used in the Gerats Principle it is to be expected that memdeck workers will have the most benefit from the principle and they will probably be the first to find other applications for the principle. For those among you who noticed that the basic effect shows some similarity with Eddie Joseph's Invisible Influence it is of interest to know that with the Gerats Principle you are in absolute control that a match or matches will appear, it is no longer a matter of chance. You don't instruct the spectators to place certain cards at certain positions, you tell up front before any dealing of the cards what the matching cards will be and at which positions they are located. Above all the methods of Invisible Influence and the Gerats Principle are diabolically different. 1st edition 2016, 27 pages. If you like Mem Deck work this is an interesting new tool to play with. It feels like a topic that is only having the surface scratched. This ebook is definitely one for the thinking magician who loves exploring concepts and principles. The most obvious use for principle would be a strong phase in an incredible memory feat. For my tastes some of the effects could be quite long for laymen with a lot of dealing however while not covered to a great degree in the eBook the maths can be applied to any size of packet of cards. This can be used to create quite commercial and practical effects such as matches not only with playing cards but with related pairs such as movies and film stars, famous couples, songs and bands for example. So even if math based effects aren't your thing don't dismiss this ebook. The book is well written in a pleasant conversational style and was a interesting read. I would recommend it.